UDM Downloads > Pinochle & Bezique by MeggieSoft Games! MeggieSoft Games Pinochle & Bezique is a comprehensive implementation of the original Pinochle and Bezique card games (the two-player versions). Play against an online opponent or against your computer. Pinochle & Bezique has a rich user interface with many customizable visual, audio, and game options. Six different computer opponent skill levels are available for when you are unable to get online, or just want to practice privately. Both are games of accumulating points from melding cards and winning tricks with the object of reaching the points target before your opponent. Each round has two phases; the first of which is used to take new cards from the stock and to play melds, the second being the playing off of the remaining cards as tricks. Points are scored for melds, and for winning tricks in phase two. The standard set of melds in each game are optionally enhanced by commonly documented additional meld types. The user interface, common to all MeggieSoft Games, supports both point-and-click and drag-and-drop mouse operations. 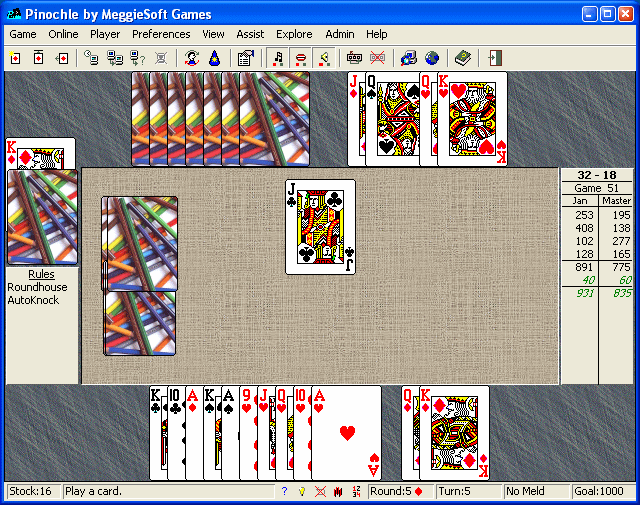 Features include: realistic animated card movement; right-click pop-up menus; a hint facility; a tutorial; automatic play; automatic save and restore of partly finished games; multiple-user scoreboards; a clean and uncluttered main window; status-bar shortcut buttons; and fully customizable main display font and wallpaper effects for the table and playing mat, and the card backs.